This is a great Sunday lunch option if you are having a crowd around. Preheat the oven to 180°C/350°F/Gas Mark 4. 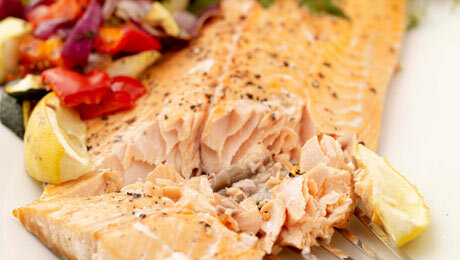 Place the salmon onto a large roasting tray, season lightly with some seasoning. Scatter the herbs on top along with the lemon wedges and then pour the wine on top. Place in the preheated oven for 30-35 minutes until gently cooked. Portion with a metal spatula and serve immediately with the Mediterranean vegetables. Place the potatoes, lemon wedges and oil into a large mixing bowl. Season well with some salt and pepper and mix well. Transfer to a flat baking tray and roast for 45-50 minutes. Arrange all of the vegetables in a large roasting tray with the thyme sprigs and olive oil and roast for 35-40 minutes. Be the first to add a review.